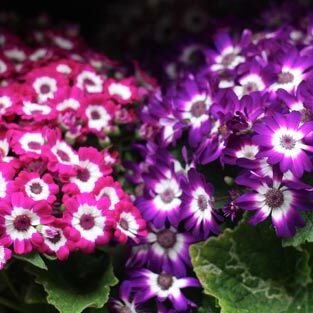 Although they take a little care, Cineraria with their masses of flowers from winter to spring they are a plant that will add colour to the garden. They do like moisture, and are best in a position away from the hot afternoon sun, other than that, they are just blooming marvels. They come in a range of colours many with pale white centres that contrast against the darker petals. Cineraria are an annual or tender perennial flower mostly grown in pots and containers. Masses of bi coloured flowers they begin to appear in nurseries in late winter to spring. The type readily available is Pericallis x hybrida (Senecio cruentus, x hybridus) and although colourful they are not fragrant. Mainly grown as an indoor plant Cineraria are also well suited to a position on a patio where they get shelter from frosts and cold, bright light, but not direct sun. Fertilize every week with a diluted liquid seaweed fertiliser or use a slow release general purpose fertilizer. Although they do not like direct sun, however very low light will inhibit flowering, very cool temperatures will cause foliage to darken. Lack of moisture and to much heat also cause problems. Although Cineraria are mostly grown from seedlings you can also grow them from seeds. The seeds are best sown in early spring in trays. The seeds need light to germinate so they are surface sown. Use a seed rising mix and sift a layer over the top to provide a fine flat surface. Sow the seeds on top and gently press them down to make firm contact. Mist spray and keep the seeds moist. Germination usually takes between 10 and 20 days. Once the seedlings are large enough to handle they can be translated. From seed to flowering will take around 4 months. Light – A position in filtered shade is best. Water – Regular water is best, making sure to allow the soil to partially dry between waterings. Fertiliser – For indoors, use a slow release general purpose fertiliser for flowering plants. Re potting – When re potting be careful not to over pot. Increasing the pot size can sometimes restrict flowering and encourage vegetative growth. Humidity – Ensure good airflow to prevent fungal diseases.